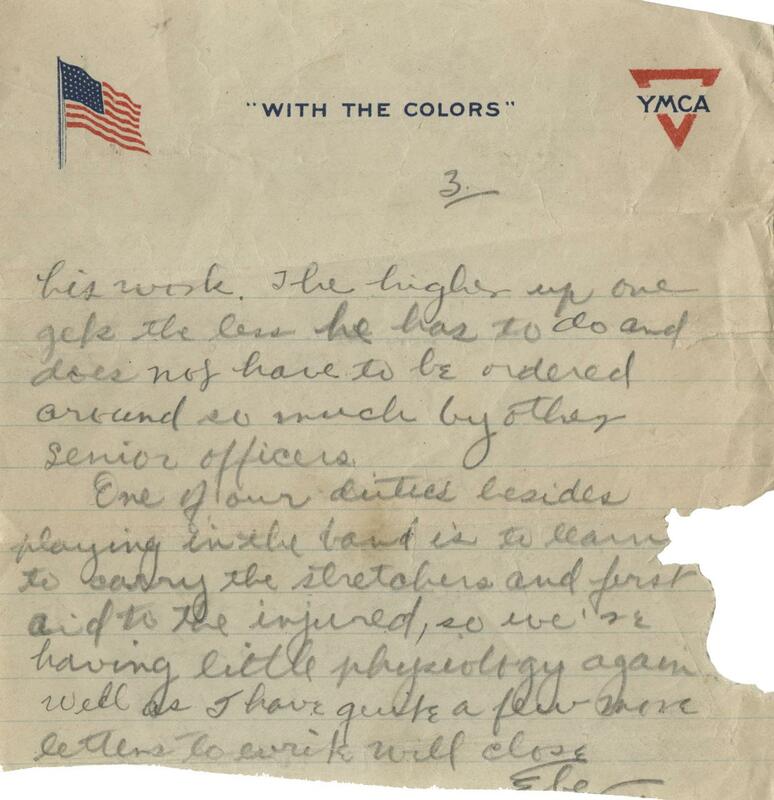 In this letter Eber Berquist writes to his mother to update her about everything going on at camp. The most exciting thing that has happened to him was being accepted into the band. 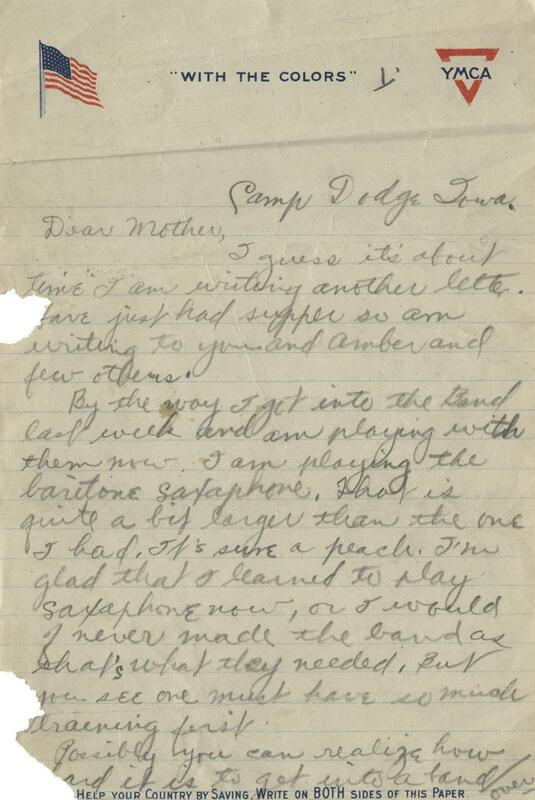 He states he will be playing the baratone saxaphone, which is much larger than the saxaphone he was used to playing. He also tells his mother that of the 10 men who auditioned to be in the band, only 4 made it, so it was a great honor to have been selected. 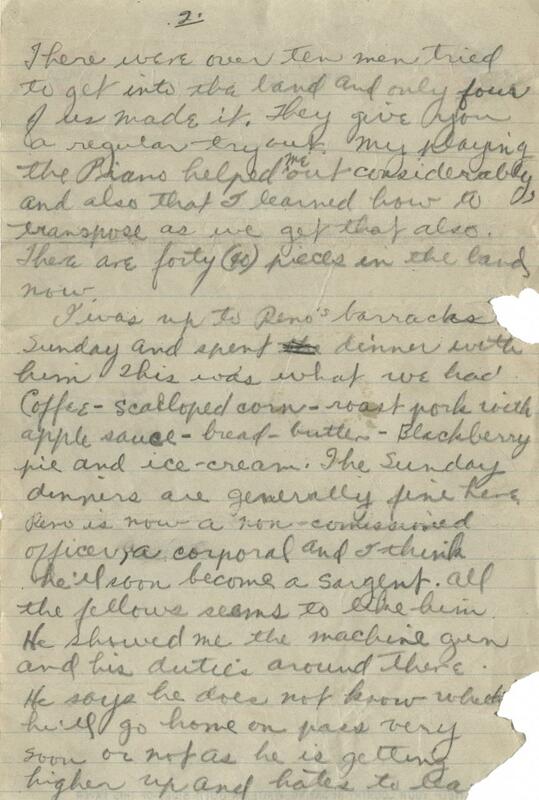 This letter highlights that soldiers did more than just fight and train during the war; they also had the opportunity to participate in more leisurly activities. I guess its about time I am writing another letter. I have just had supper so am writing to you and Amber and few others. By the way I got into the Band last week and am playing with them now. I am playing the baritone saxaphone, that is quite a bit larger than the one I had. It's sure a peach, I'm glad that I learned to play saxaphone now, or I would never made the band as that's what they needed. But you see one must have so much training first. Possibly you can realize how hard it is to get into a band. There were over ten men tried to get into the band and only four of us made it. They give you a regular try but my playing the piano helped me out considerably and also that I learned how to transpose as we get that also. There are forty (40) pieces in the band now. [...] One of our duties besides playing in the band is to learn to carry the stretchers and first aid to the injured, so we're having little physiology again. Well as I have quite a few more letters to write will close.